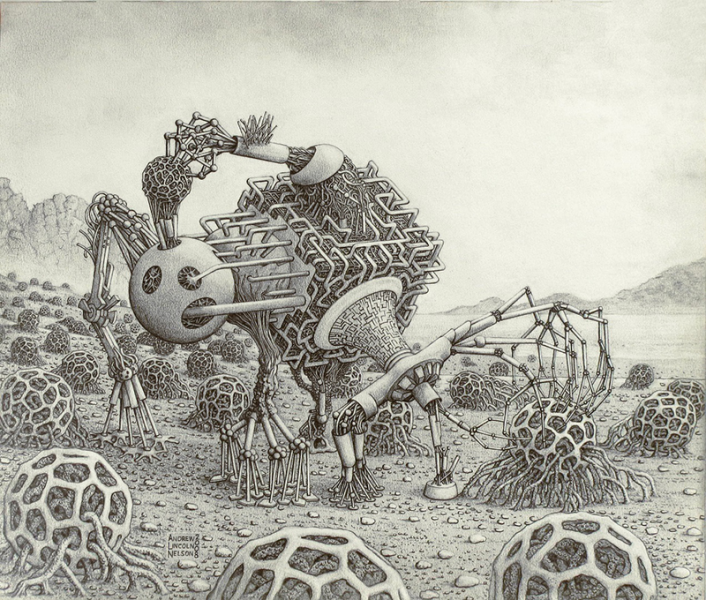 Taking hints from modern research in the field of artificial intelligence and evolutionary biology, Andrew Nelson describes the machines in his drawings as ‘creatures’ that have perhaps moved beyond their biological origins to become self-perpetuating life forms. Andrew believes that these machines explore the possible features that all humans potentially share with other living life forms. He chooses to focus on this aspect rather than the way in which these creatures are unhuman like. 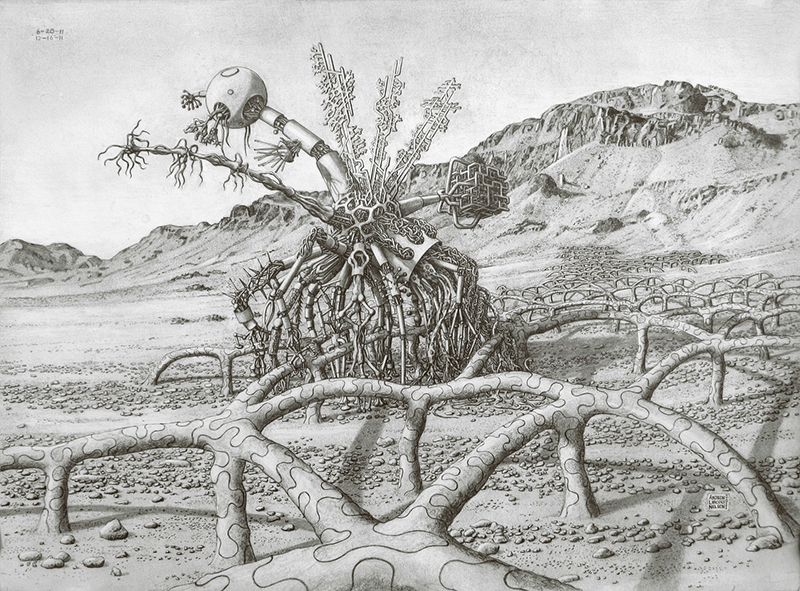 While the main subject of his beautifully detailed pencil drawings would seem to be these unearthly, futuristic machines, Andrew says that the background landscapes are a main component of these pieces. Utilizing a large amount of nature photography, he does numerous studies of textures that are found in nature, everything from cactus skeletons to bits of coral, to create the complex worlds in which these ‘creatures’ reside. This aspect of the drawings only adds to the intricacy of each piece, which can take Andrew over a year to produce from start to finish. After sharing some of the pieces from this series entitled ‘Living Machine’, Andrew received such positive feedback that he decided to take the chance and enter one of them in the Professional category of the NAP show at the University of Arizona. Andrew’s decision was validated when the judges awarded him First Place for his piece “Robot 25”. "I was quite surprised to win and the ecstatic feeling is hard to describe," says Andrew. Pencil drawing entitled 'Robot 25' from Andrew's Living Machine series.